More than a dozen parks dot the city of Bangor, featuring water fountains, gazebos, swimming pools, playgrounds, and plenty of shaded areas for just laying back and enjoying the outdoors. Here is a list of city parks, where they're located and what they feature. Bangor also offers a variety of hiking and biking trails. Bangor Gardens: Deep within the Bangor Gardens housing complex, formerly used by military personnel, Bangor Gardens Park features a basketball hoop and a playground. In the summer, the Bangor Parks and Recreation Department conducts programs for children at the park. In the winter, a portion of the park is flooded for ice skating. Bass Park: Home of the Bangor State Fair each July, Bass Park offers harness racing in the summer with free admission. Bass Park is also home to the Bangor Auditorium and Bangor Civic Center. Dutton Street (off Main Street) and Buck Street (off Main Street). Brown Woods: Far removed from Bangor's busy streets, Brown Woods offers 28 acres and 4,000 feet of walking trails. 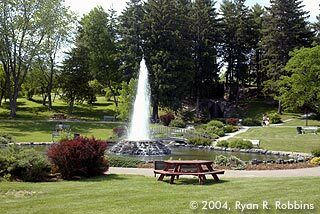 Grotto Cascade Park: By far the city's most beautiful and popular park, Cascade Park features a lighted water fountain and a water fall that's more than 20 feet high. The park, which overlooks the Penobscot River, also has a small gazebo, picnic tables, and short walking trails. State Street, past Eastern Maine Medical Center. Chapin Park: A simple park on the city's east side, Chapin Park offers children a playground, an expansive green, a summer recreation program for children, and ice skating in the winter. Next to Abraham Lincoln Elementary School, Parkview Avenue (off State Street) and Forest Avenue (off State Street). Coe Park: This small neighborhood park features a basketball hoop, a playground, and a summer recreation program for children. Dakin Park: Somewhat out of the way on the city's east side, Dakin Park is home to the city's east side swimming pool during the summer. The park also has a basketball hoop. North Park Street (off Broadway and Stillwater Avenue). Battleship Maine memorial, Davenport Park. Davenport Park: "Remember the Maine!" Americans cried as the Spanish-American War began after the battleship Maine sank in the Havana, Cuba, harbor after a mysterious explosion on board. Americans said the Spanish blew up the ship. The Spanish said they had nothing to do with it, that the ammunition on board exploded in an accident. 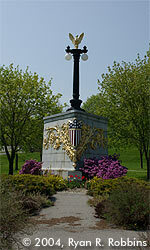 Today, the shield of the Maine can be seen at Bangor's Davenport Park Maine Memorial. The park features the memorial, a number of shady trees, and an excellent hill for sledding in the winter. Corner of Main and Cedar streets, close to downtown. Essex Street Recreation Area: Recreation enthusiasts who are up for a challenge can try their hand at maneuvering their mountain bikes through the 70-acre Essex Street Recreation Area. Or, in the winter, sledders can slide down Essex Street Hill. The park features an asphalt basketball court, an outdoor volleyball court, and a Police Athletic League activities building for children. The walking trails, which are shaded, wind around a bog. Fairmount Park: A neighborhood park, Fairmount Park features a playground, a basketball hoop, some shade, a summer recreation program for children, and ice skating in the winter. Norway Road (off Webster Avenue and Hammond Street) and Royal Road (off Webster Avenue and Hammond Street). 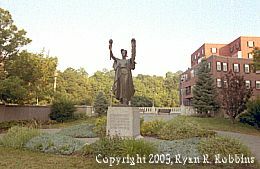 Victory Memorial at Norumbega Parkway in downtown Bangor, between Central and Franklin streets. Hayford Park: Hayford Park is the major park on the city's west side. It features a swimming pool; two fenced and lighted tennis courts; a basketball court; volleyball net; the city's creative playground; Sawyer Arena; Mansfield Stadium; and a small, unfenced softball field. Union Street and 13th Street (off Union and Hammond streets). Kenduskeag Stream Park: Only a minute or two from downtown Bangor, Kenduskeag Stream Park is a perfect place to take a break for a few minutes sitting on a bench or at a roofed picnic table. The park also features a 2 1/2-mile walking trail that overlooks the stream from Franklin Street, along Valley Avenue, and just after the Interstate 95 bridge. The trail is perfect for unwinding after a stressful day and for gathering one's thoughts. It was also one of Henry David Thoreau's favorite places to explore nature when he visited his cousins in Bangor. Norumbega Parkway: An ideal location for lunch or a mid-morning or mid-afternoon snack in downtown Bangor, Norumbega Parkway was the site of Bangor's original Customs House, post office, and Norumbega Hall, all of which the Great Fire of 1911 destroyed. Today, it is the home of the War Memorial, a statue by Brewer native Charles Tefft that commemorates the lives of all those who have died in war for the United States. The park is actually an island in the Kenduskeag Stream. Franklin Street and Central Street. Paul Bunyan Park: Probably the city's second most popular park, most people don't even know it's a park. 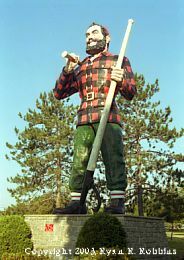 The park is easily recognizable because of its main occupant, a 31-foot high statue of Paul Bunyan. The statue is a bit cheesy, but tourists enjoy stopping and taking pictures of it just the same. The park also features a gazebo where the Bangor Band puts on summer concerts every Tuesday evening, a water fountain, and an expansive greenery. A skateboarding park opened here in 2001. The park is also home to the Bangor Region Chamber of Commerce. Prentiss Woods: Named in honor of former Bangor mayor Henry E. Prentiss, Prentiss Woods offers 35 acres of walking trails. Grandview Avenue, adjacent to Bangor High School. Riverview Park: On the banks of the Penobscot River, Riverview Park is at the city landing, next to the Joshua Chamberlain Bridge. The park is the site of free weekly concerts during the summer. Front Street, off Railroad Street and Main Street. Stillwater Park: A simple park with an expansive green, Stillwater Park features a basketball hoop and a playground. In the summer, the park hosts a recreation program for children, sponsored by the city. A portion of the park is flooded in the winter for ice skating. 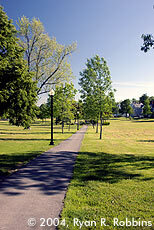 Summit Park: Summit Park is an untapped treasure in Bangor's park system. It is home to the Thomas Hill Standpipe, which can be seen for miles around, especially on clear nights because of the lights that surround the top. The park is a quiet little getaway just seconds from a busy downtown. Thomas Hill Road, off Ohio Street and Union Street. Williams Park: A small park overlooking the Penobscot River on the east end of the city, Williams Park features a basketball hoop, a small playground, and tennis courts.